The origins of the swan as the emblem of Buckinghamshire are lost in a confusion of medieval romance, a joke, and the sovereign’s appetite. Swans were bred for Anglo-Saxon kings whose line ended with the Norman Conquest. 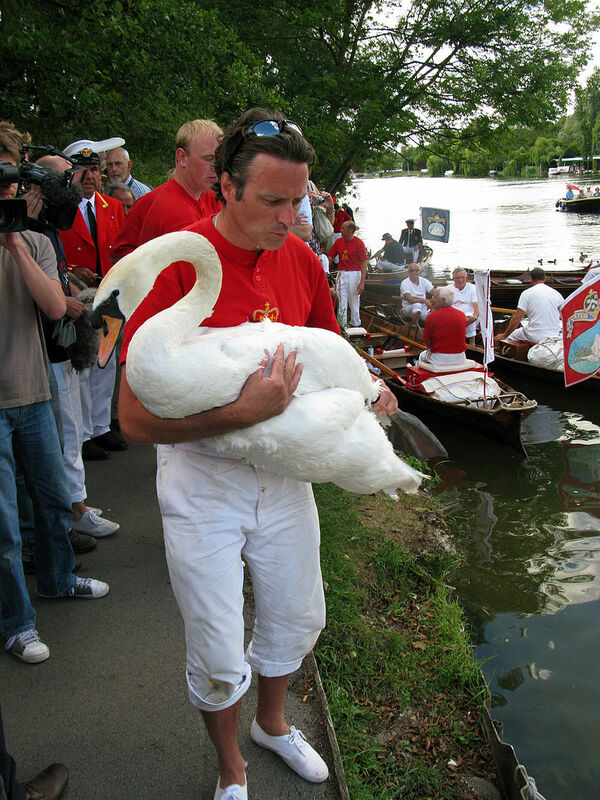 Today the Vintners’ and Dyers’ Companies share with the sovereign ownership of swans which is celebrated each July when Swan Uppers of the two City Livery Companies dressed in their scarlet uniforms row the Thames to catch and ring the feet of swans with cygnets. In 2009 the Queen as ‘Seigneur of the Swans’ attended the ceremony which is, in effect, an annual census. To encourage the interest of children in wildlife, schools are invited to meet the Swan Uppers on their journey. Other possible origins of the swan as the county emblem are a joke and an ancient myth. Henry II appointed Henry of Essex as Sheriff of Buckingham. One of his ancestors had been known as Sweyn, a name close enough to ‘swan’ to have given rise to a pun, a common practice in those times. 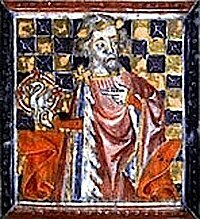 Thomas, youngest son of Edward III, married Eleanor De Bohun whose family claimed descent from the mythical French Knight of the Swan each of whose children was born a swan with a silver chain around its neck. Their crest was a chained swan ‘ducally gorged’, that is to say with a ducal coronet encircling its neck. Her family also inherited a swan emblem which had passed through the Mandeville family from Henry of Essex. In 1377 Thomas was created the first Duke of Buckingham thus providing another link between the county and the swan emblem. This, the first Dukedom of Buckingham, became extinct In 1521 when Henry VIII executed the Third Duke for treason. It was not until 1623 when James I gave George Villiers the title First Duke of Buckingham that the Dukedom was recreated. From the reports of heralds whose duty it was to check the use of arms it seems that between these two dates ‘the town and borough of Buckingham’ appropriated the swan for its arms and seal, adopting the sable and gules colours, that is black and red, from the livery of one of the holders of the first creation of the Dukedom. Today the swan and the black and red colours appear on badges of towns of the county and as the colours of its sports clubs.